Jack Carlton Moore was born in Chicago, Illinois on September 14, 1914. He was the youngest of three boys who grew up in a loving family home. His father was a real estate developer. Before his rise to the silver screen, Moore first became an acrobat in a flying circus troupe when he was in his twenties. This troupe of talented daredevils was the first to work without the benefit of a net, and the first to work over water. After Moore left the troupe, he went on to do some modeling jobs in New York before he finally found his way to Hollywood in 1938. He had changed his name to Clayton Moore in the mean time, and he did some stuntman work and some extra parts for the movie industry. By 1941, Moore was working steady for Republic Pictures. He portrayed heroes, the guys in the white hats, as well as bad guys, who always wore the black hats, of course, in several western movies. But it was 1949 when Clayton Moore finally got the big break that would change his life forever. "The Lone Ranger Show" had been on the radio for fifteen years by now, and Republic Pictures had already produced a couple of low-cost Lone Ranger films. But the studio decided it was time to make a weekly series out of the famous "Lone Ranger." A man named Brace Beemer successfully did the radio voice, and he wanted to play the lead part of the weekly series. But, instead, Moore got the part as the leading man. After George W. Trendle, the creator of the "Lone Ranger" saw one of Moore's pictures called, "Ghost of Zorro," he knew that Moore was the best man for the part. With Clayton Moore's talent, youthful good looks, and his stuntman abilities, he was a shoo-in. Now that Trendle had found the perfect Ranger, actor Jay Silverheels was also signed on to star with Moore in the thirty-minute western series. Silverheels portrayed the Lone Ranger's faithful companion, an Indian named Tonto. The show was scheduled to make its television debut in September of 1949. The premise of the show was that the Lone Ranger had to wear a mask in order to disguise himself because he was the only survivor of a group of Texas Rangers. Bad guys had attacked the group. Injured, but still alive, the Indian named Tonto took care of the last remaining Ranger and brought him back to health. The two joined together and continued the fight against injustice. And with that, for the next three years, actor Clayton Moore became known as the "Lone Ranger," the hero who rode though the Wild West on his horse named Silver with Tonto, fighting bad guys and restoring law and order everywhere they went. Moore played the part until 1952, when he had a dispute with the studio over his contract. Moore was said to have been a man with strong morals and convictions, and the dispute forced him to leave the part he had come to love so well. Actor John Hart was cast to play the "Lone Ranger" for the next two years, and that didn't please the public. The studio received tons of fan mail asking that Moore be brought back. And, in 1954, Clayton Moore returned to the part. 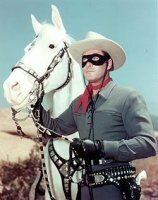 When the show ended in 1957, Clayton Moore traveled and did personal appearances as the "Lone Ranger." Moore used the Ranger's upright character to lecture to children against the evils of using drugs, drinking alcohol, smoking and swearing. Finally, in 1978, a new "Lone Ranger" movie was scheduled. Unfortunately, the movie's cast did not include Clayton Moore, as the producers felt he was too old for the part. 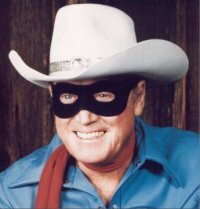 They also requested that Moore quit making personal appearances as the "Lone Ranger" character. Moore responded by taking the matter to court. However, the court ruled against him, and he was forced to remove the black mask, which was an essential part of his costume. Undaunted, Moore continued to make his personal appearances. But, now, he wore sunglasses instead of the mask. Interestingly enough, the "Lone Ranger" movie was made as planned, and it promptly became a flop. Clayton Moore acted in about seventy films during his career, but he loved playing the "Lone Ranger" best of all. 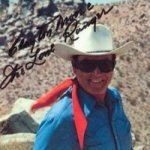 Some of his films included, "The Legend of the Lone Ranger" in 1949, "The Lone Ranger", in 1956, and "The Lone Ranger and the Lost City of Gold", which came out in 1958. Clayton Moore was awarded a star on The Hollywood Walk of Fame, which was unveiled in 1987. Moore was so closely identified with his portrayal of The Lone Ranger that his is the only star on The Hollywood Walk of Fame that is also inscribed with his character's name. Clayton Moore was eighty-five years old when he died of a heart attack in his home near Los Angeles, California. His wife Clarita, and his daughter, Dawn Moore Gerrity, and his legacy that will continue to live on survived him. "Today, we've lost a part of America in the passing of Clayton Moore," said Johnny Grant, the honorary mayor of Hollywood, who helped unveil Moore's star on the Hollywood Walk of Fame in 1987. "He was a great showman and a great human being." The Lone Ranger™, and associated character names are trademarks of and copyright by Classic Media, Inc.